The HVAC system of your house is an open system. This means that it is in constant contact with the indoor environment. For this reason, it is perfectly possible for particles found in the home to get inside the ductwork of the system and get accumulated there. That is why regular air duct cleaning helps to keep the quality of the air in the rooms optimal. Find out more about the types of particles which most commonly enter the ductwork and get built up there. Dust is the most common type of contaminant. It is present in every home and in every HVAC system as well. It consists of fine particles from various sources including dry food, dead skin cells, tiny fibers and parts of microscopic bugs like dust mites. All of these particles may cause allergy especially in people with lower immunity. For reducing the level of dust, you have to clean all surfaces in the house. 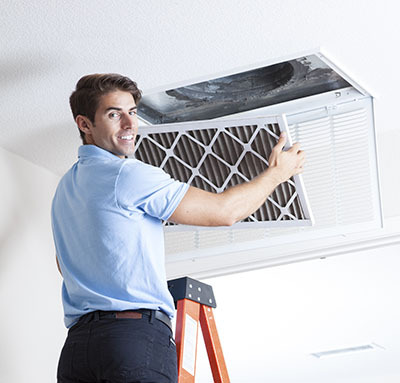 The air ducts and filters have to be cleaned as part of regular HVAC maintenance as well. Dirt also consists of fairly small particles. However, they usually come from soil, oils used in the household and other granular and sticky substances. Dirt is sticky and this makes it easier to accumulate inside the ductwork. If it is left on a surface for too long, it may damage it. This will pose the need for timely air duct repair. Fine particles from dirt accumulations can also be released into the air and cause irritation or discomfort. Pollen is one of the most potent allergens founds in homes. It is actually powder coming from plants. The particles are so fine that they are easily carried by the air and stick to all surfaces which get in their way including those of the ductwork. The professionals of Air Duct Cleaning Sausalito stress on the importance of careful pollen removal. It has to be suctioned completely out of the system. The surfaces have to be sanitized so that pollen is less likely to stick to them in the future. Pet dander and fine hairs accumulate in the air ducts of households keeping cats and dogs. These particles can also cause irritation and respiratory discomfort especially when the accumulation inside the ductwork becomes large. When you have pets, air filter replacement is required more often. The ducts may have to be cleaned more frequently as well. Mold is present in most air ducts, but it cannot always be clearly seen. When it keeps growing, it poses a serious risk of allergies and can cause considerable damage. Mold is removed with special treatment and air duct sanitizing so that the risk of future growth is reduced to the minimum. If they are leaks letting water in, they have to be sealed.